Sometimes there are luxury condominiums that are luxurious for reasons other than amenities. Open living areas with floor to ceiling windows, gas fireplaces, flooring such as bamboo wood, vaulted ceilings, glass showers, stone countertops, two-car garages, and exquisite views can mean as much as multiple pools and clubhouses. Add a location like the middle of downtown Pensacola, and that is what you get with Port Royal condominiums. Although Port Royal was built in 1984, this gated condo community is so popular and sought-after the homes have been maintained and upgraded continuously. The large three-bedroom units have three baths and over 2,200 square feet of room. Two-bedroom two-bath units average 1,235 square feet. All have the best luxury appointments. Prices range from $300,000 to $600,000, with the occasional first-floor bayfront units listed at several hundred thousand more. 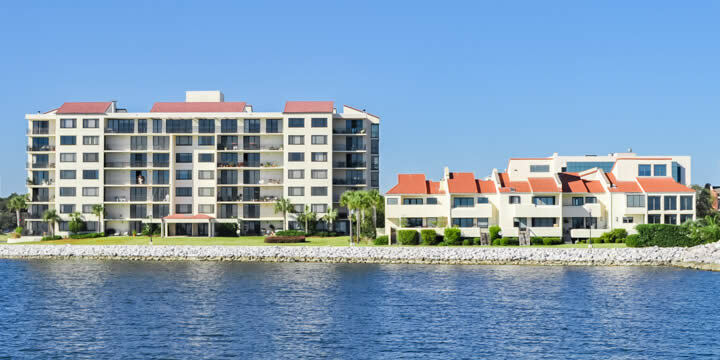 The seven-floor tower sits on the end of a little sliver of land that is surrounded on three sides by the waters of the Pensacola Bay, providing panoramic water views from many of the units. The Palafox Marina is on one side, with wooden boat docks and a brick promenade to enjoy right out of the door. Those who do not care for a high-rise will be happy to see Meditteranean-style townhome-condos of stucco in low-rise, three-floor structures scattered throughout, with a gated courtyard for each condo. All share a one or two-car garage, community pool, fitness room, and clubroom. Port Royal Resort offers your chance to live Bay-front in the heart of downtown Pensacola. You can enjoy all it has to offer with restaurants, shopping, baseball games, festivals, and atmosphere - all within walking distance. Park your boat in the marina and you are set to step out the door and hit the deep water. What more could anyone want for the perfect Florida lifestyle? Call Emerald Coast Realty for an appointment to see the available condos for sale in Port Royal soon.